Stores reference 22/897. 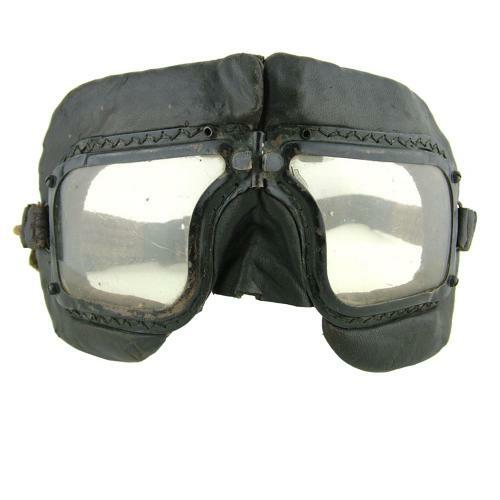 One of the classic 'Battle of Britain' pattern goggles. The frame is quite good, retaining much of the original paint finish with only light rubbing and paint loss on exposed points. All of the frame screws are original and both frame 'stops' are in place. The leather surrounds are also good and the internal padding remains supple. Both lenses have light scuffs and surface marking but display very well. The strap springs are excellent on the left side but one spring is damaged on the right. The leather strap section has surface wear and cracking and the buckle has surface corrosion. Stitched reinforcement/repairs can be seen where the strap is attached on the right side. The strap is embossed with RCAF reference markings and 1942 date. A good '+' pair of goggles. Stock code G17713.